IMF warns of 'rising inequality' Jump to media player Banking reforms aimed at preventing another financial crisis have failed to make enough progress, the head of the International Monetary Fund (IMF) has warned. IMF approves $17bn Ukraine bailout Jump to media player The International Monetary Fund has approved a $17.1bn bailout for Ukraine to help the country's beleaguered economy. 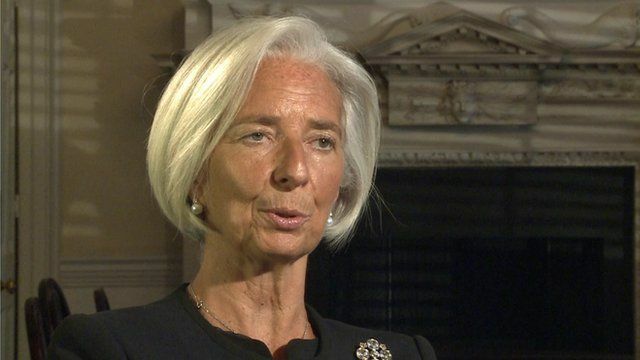 IMF: UK forecasts 'too pessimistic' Jump to media player The International Monetary Fund (IMF) says the UK economy will be the fastest-growing in the G7 this year, and admits its forecasts were "too pessimistic". Banking reforms aimed at preventing another financial crisis have failed to make enough progress, the head of the International Monetary Fund (IMF) has warned. IMF managing director Christine Lagarde blamed a combination of the complexity involved, industry lobbying and "fatigue" for the delay. Ms Lagarde also warned that a number of factors such as technology and the global economic crisis had contributed to growing inequality.